ANE MODEL was founded in 2006. Our business concepts are based on breaking the barriers between humans and technology. ANE MODEL is the first company to patent servo control worldwide. At the same time, ANE is also a developer of DCC decoders. The multi-brand strategy integrates SmartSwitch，LocoCruiser，and LocoHorn, effectively expanding the world market. A mutually beneficial and sustainable distribution model make us grow continually. ANE MODEL aims to produce products which are friendly to our environment. We then, establish a complete supply chain through collaborative research with our partners. ANE MODEL is proud to be a new generation manufacturer of DCC Control Systems ODM and OEM. 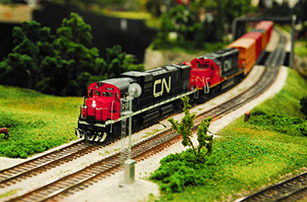 Over the past five years and today, ANE MODEL continues to create new products in a fast-paced and special model railroad industry. This proves we are moving in the right direction. Our R&D and marketing strategy out-shines our competition and is an important cornerstone in our future growth.